While there is no puffed rice diet, this nutty-tasting, low-calorie cereal makes a good choice if you're trying to lose weight or limit your sodium intake. But its high-glycemic index means it may not keep you feeling full for too long. Consult a dietitian to help you determine how puffed rice cereal may fit into your diet plan. 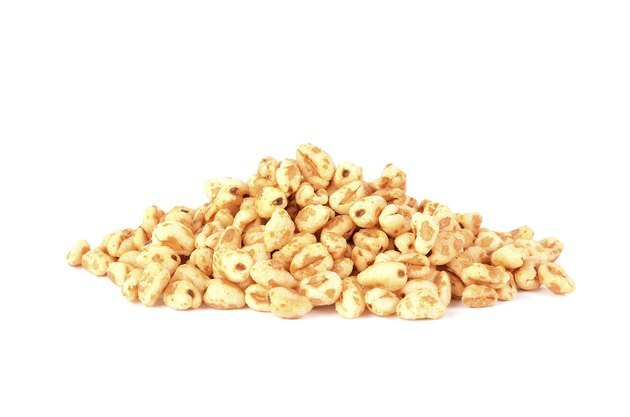 Puffed rice cereal is low in calories, fat-free and sodium-free. It's also, however, not a very good source of protein or fiber, or a significant source of any vitamin or mineral. A 3/4-cup serving of the cereal has 54 calories, 12 grams of carbs and 1 gram of protein. The cereal contains a few of the B vitamins, including thiamine, riboflavin, niacin and folate, but in small amounts. The cereal also contains small amounts of some minerals, including iron, magnesium, phosphorus and zinc. Compared to other ready-to-eat cereals, puffed rice is very low in calories. A 3/4-cup serving of a bran flake cereal has 98 calories, and swapping out your bran flakes for puffed rice can save you 44 calories per serving. If you're trying to lose weight, saving an extra 44 calories a day may help you lose 1 pound every 2 1/2 months. While that may seem like a slow way to lose weight, every little bit helps. While puffed rice is low in calories, it may not keep you feeling satisfied for long due to its glycemic index. Puffed rice is considered a high-glycemic food, which means it's digested and absorbed quickly. This also means the low-cal cereal may cause a rapid rise in blood sugar, meaning it's not the healthiest choice for people with diabetes. By itself, the puffed rice cereal is digested rapidly, but combining your cereal with healthy ingredients can help you reduce its glycemic index and up its flavor. Add sliced strawberries or a handful of blueberries to your cereal for a touch of sweetness. Or mix your cereal with nonfat plain yogurt, a few chopped almonds and some raisins for a tasty and satisfying breakfast or snack. Serve your puffed rice cereal with skim milk -- it has a lower glycemic index than low-fat milk, and it saves you a few calories.